Love it or hate it, pumpkin is the flavor of Fall and no-bake pumpkin cheesecake is the way to enjoy the season. Give your oven a break and make cheesecake! The minute the air has a slight chill it time to whip out the boots, scarves and all things pumpkin spice. From lattes to muffins pumpkin has become the official flavor of Fall. Our family is rather ambivalent on the subject. We don’t run out mid August and start stalking the Starbucks guy asking when the PSL (Pumpkin Spice Latte) release date will be, but we do enjoy a good pumpkin muffin or dessert. We especially LOVE pumpkin pie around Thanksgiving. I have been hosting our family’s Thanksgiving for several years now and yes, we love pumpkin pie but… I don’t love the pies taking up precious oven space on that all important day. I wanted to come up with something just as tasty, but easier to make. Preferably, I would rather not have to bake it at all! That’s when I came up with this SCRUMPTIOUS no-bake pumpkin cheesecake using my favorite International Delight Simply Pure Vanilla Creamer as a base for the cheesecake. 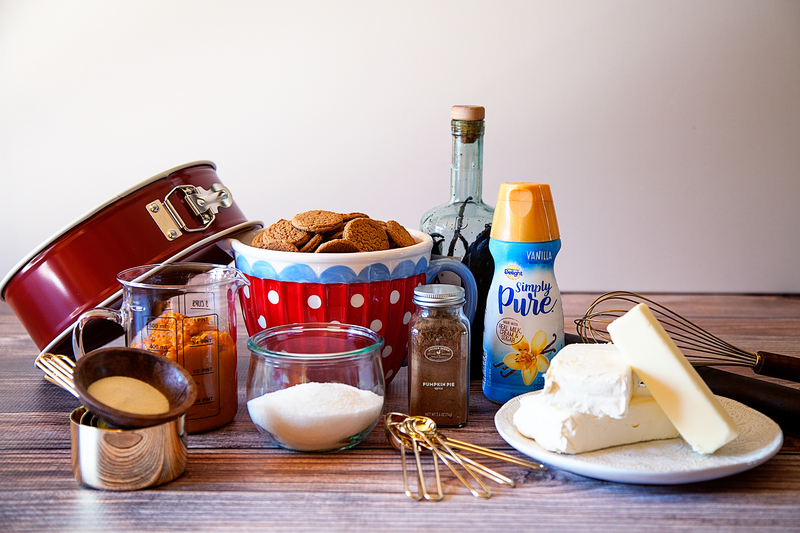 If you haven’t tried it yet, Simply Pure is just that… Simply milk, cream & sugar. Here are the ingredients. INGREDIENTS: SKIM MILK, CANE SUGAR, CREAM, CONTAINS 2% OR LESS OF: NATURAL FLAVOR, GUAR GUM. What’s Guar Gum you ask? Well, it’s a natural food additive produced from the Guar Beans that helps to make Simply Pure nice and creamy. It stabilizes the other ingredients, acts as a thickening agent and doesn’t allow ice crystals to form. You eat it every time you eat ice cream too. 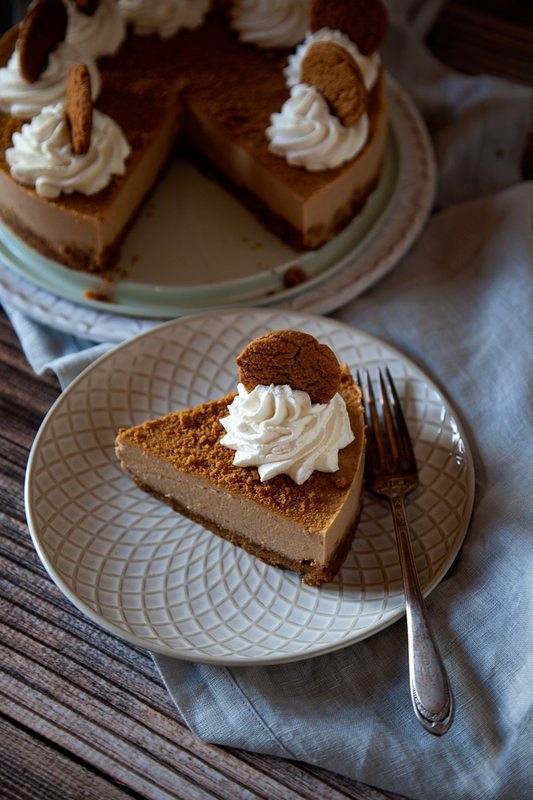 I chose Simply Pure Vanilla for the no-bake cheese cake but, if you’re head-over-heels for all things pumpkin and want to amp up the pumpkin game, you can always use International Delight Pumpkin Pie Spice Creamer. International Delight has all kinds of fun ideas that you can use their tasty creamers with. You know… Creamer isn’t just for coffee! Follow them on Instagram, Facebook or Pinterest to find all kinds of fun recipes. This no-bake cheese cake is so easy to whip-up that you might even find yourself whipping it up for an everyday treat, not just a holiday one. I put together a quick video to show how easy it is to make this tasty dessert. This new take on pumpkin pie will win the day and save the oven! You might even find that you make it for a special treat anytime, not just the holidays. Place 40 ginger snap cookies into a large Ziplock bag or the food processor. Using a meat mallet or rolling pin, crush the cookies into a sand like consistency. If using a food processor, pulse a few times to get the consistency of sand. Place crushed cookies into a large bowl and combine with melted butter. If using the food processor, add the butter and pulse to combine the butter. Spray a spring form pan with cooking spray and pour the cookie mixture into the pan. Using the bottom of a measuring cup, pack the cookie mixture into a nice layer of crust. Set the crust aside. In a small bowl, pour 1/2 a cup of Simply Pure Vanilla Creamer and whisk in the gelatin packets. Set aside and allow the gelatin to bloom. In a medium sauce pan, pour the remainder of the Simply Pure Vanilla Creamer and place over medium heat. Add the room temperature cream cheese and gently stir to combine the two ingredients. Once the cream cheese has melted into the creamer add the pumpkin, pumpkin pie spice, sugar vanilla and salt. Whisk together and let come just to a light boil and then remove from the heat. Make sure to continue to stir occasionally. Remove from heat and taste the mixture to make sure you have the right flavors. If you prefer your cheesecake a little sweeter, add more sugar. If you like it with a little more spice, add more pumpkin pie spice. Pour the cheescake mixture into the spring form pan and place in the refrigerator for at least 4 hours. When ready to serve, make up some more cookie crumbs with the ginger snap cookies reserving 6-8 for garnish. Sprinkle the crumbs onto of the no-bake cheesecake and then decorate with whipped cream clouds topped with cookies.